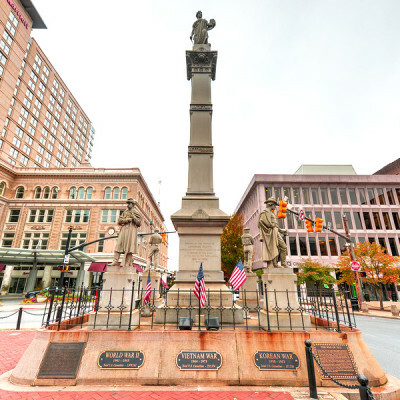 Soldiers and sailors monument at Penn Square in downtown Lancaster, PA.
At the January Lancaster Commercial and Industrial Real Estate Council (C&I Council) meeting, Lisa Riggs, President of the Lancaster Economic Development Company (EDC) and EDC Finance Corporation discussed the EDC’s strategic plan and specific goals for 2015. Ms. Riggs focused on how the EDC intends to be more strategic in their activities this year, as opposed to being reactive in response to partners needs as they have been in the past. For the last 5-10 years the EDC has focused on building the EDC Finance Corporation, which has been very successful, and now it is time to turn the ship. Again and again, the word intentional was used to describe how the EDC plans to move full steam ahead in 2015. This is by no means an exhaustive list, but the EDC’s primary goals for 2015 include strengthening their partnerships, narrowing their industry focus, and promoting Lancaster as the place to conduct business. Successful corporations are built on strong business partnerships. The EDC recognized the significance of partnering with the real estate industry to realize their goals. The real estate industry is on the front lines and are aware of what resources are available to the EDC’s targeted industries. Therefore, the EDC intends to keep the commercial real estate industry updated on leads they receive from site selectors and the Governor’s Action Team. One of their goals is to make sure their website is more relevant to the industry and communities they serve. Ms. Riggs, also discussed the EDC’s plan for forming more deliberate partnerships with municipalities and regional city alliances to help determine what the community needs. Available resources continue to be reduced; therefore, intentional partnerships will be a hallmark for success in 2015. Narrowing a community’s focus and defining their niche has overwhelmingly become a best practice in the economic development industry. Successful communities are increasingly intentional on attracting, obtaining and growing specific industries based on their community’s culture and resources. 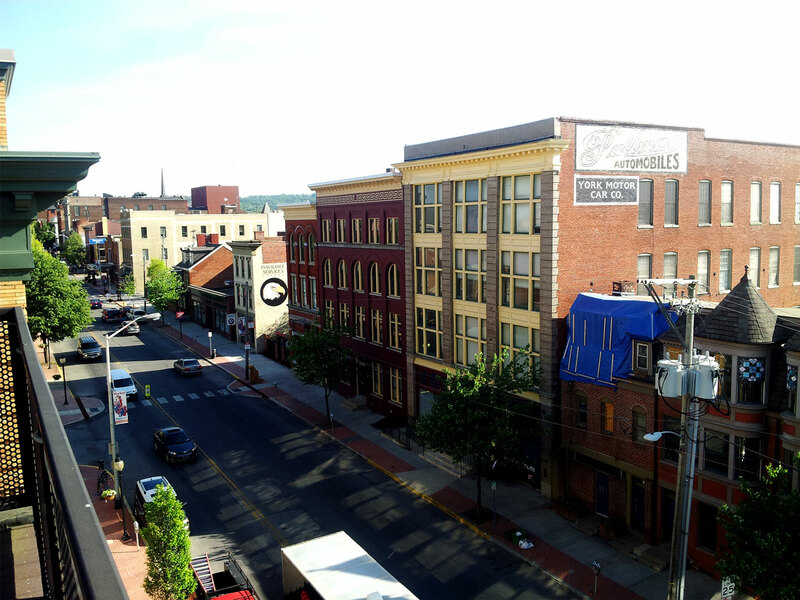 The EDC hired an economic development marketing firm to help identify and leverage what sets Lancaster apart based on metrics unique to the County. The three main Lancaster County industries identified for growth and retention were live events, professional services and food processing. The EDC is currently defining these clusters to better understand the advantages surrounding these segments and capitalize on those advantages. Lancaster County is uniquely positioned to own live events with the expansion of Rock Lititz. Due to Lancaster’s central location in the NYC and Washington, DC corridor professional services have been the keystone of the Lancaster economy. The EDC must retain, grow, and recruit professional businesses into the area to keep it a mainstay. And lastly, the emerging food processing market is a newer opportunity that the EDC will better define and work on attracting key players in this industry. But first, they have to get the word out to the masses. To succeed, the EDC must push this information out to the both the local communities and nationwide to truly be successful. The EDC will test the market place and find out what works based on hard data and facts. They will then leverage this information to their advantage. The EDC will showcase the County at every opportunity, both online and face to face. The EDC will also take advantage of large events, such as the 2015 Women’s Open at the Lancaster Country Club. This provides a perfect opportunity to showcase Lancaster to the nation. The EDC doesn’t plan to stop there. They will also attend tradeshows and most of all keep their online presence relevant to the industry. The EDC’s plan for 2015 translates well to any business’s or community’s goals. Developing strong business relationships, defining your niche and getting your name out to the masses are all great goals to strive for. Ms. Riggs outlined a sound strategy for the attendees of the C&I Council meeting to consider for their own businesses and professional careers in 2015. Rest assured, Element will be implementing some of the pointers from the EDC in 2015 and beyond.